Liz at Lancaster was delighted to host a wonderful couple from San Francisco in the States recently. It was their first time to South Africa, in fact to Africa and they were up for everything. 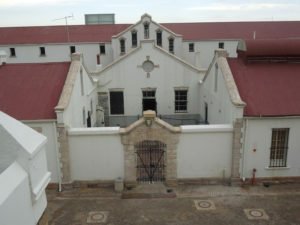 Although they hadn’t planned anything specific, which is not always a good thing, in this case it all worked out because they had sufficient time in Joburg to work around days when certain attractions were closed. 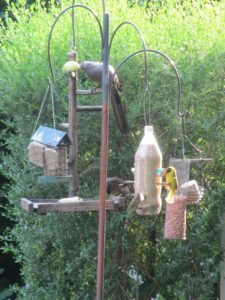 After arriving on a Saturday morning they slept, freshened up, and spent a relaxing day ‘at home’, taking lots of photos of the various birds having their fill at Liz at Lancaster’s bird feeder . Early evening they walked down to Dolci Cafe for a fabulous early evening meal returning before it got very dark for an early bed. And after an amazing first night’s rest – 12 and 10 hours solid sleep each, they were rearing to go on Day 1 proper. So we sat down and planned a great itinerary for their remaining 4 days maximising on their time and interests. Tagala dropped them at the Rosebank Mall for the Rosebank Sunday Market where they spent a good few hours (didn’t want to tear themselves away) before taking a 5 minute walk across to the Zone to catch the Red City Bus. They took a 2 day pass and for starters simply took the full 3 hour tour with commentary as an orientation. On the way home at the end of the day, they collected pizzas at Casalotti’s (fabulous thin crust with great toppings) and also walking distance from Liz at Lancaster. They decided to take an Uber to Gold Reef City in order to maximize on time and cut out the first 45 minutes of the City Bus tour. They had Uber loaded on their phone from ‘back home’ in the States which always makes things easier. 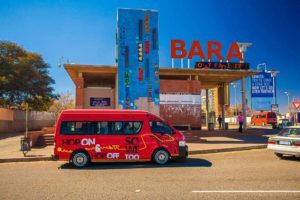 At Gold Reef City they caught the Red City Bus shuttle for a very interesting tour of Soweto and then returned to spend more time at the Apartheid Museum (all with their 2 day city sight-seeing pass). Although I had suggested going to Wits Art Museum, fortunately they reminded me that WAM is closed on a Monday and Tuesday, so we swapped days around. 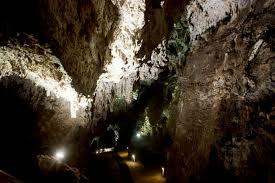 Bill particularly wanted to go to the Walter Sisulu National Botanical Gardens and they were both very keen to experience the Cradle of Humankind with its offerings of Sterkfontein and Maropeng. So I arranged the wonderful Abey Pheega to take them out to the gardens first – they walked to the waterfall and even saw the black eagles. You will have guessed by now that Bill is a twitcher! 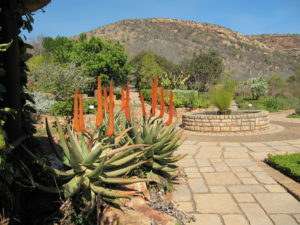 And of course an added bonus that all the aloes are in flower. Stay at our well located Guest House and experience a range of Johannesburg activities. View our Johannesburg Guest House for Rates and Availability! What better way to spend a birthday than at the origins of humankind? And then they went across to the Cradle. Today was in fact Bill’s birthday and when they got home he was beaming from ear to ear and said ‘what better way to spend my birthday than in a cave so close to the origins of humankind.’ Their enthusiasm was infectious. And to end a perfect day they had a really excellent fine dining meal at WineHouse at 10 Bompas – also 5 minutes from Liz at Lancaster. Today they hit the Braamfontein sites. Again took an Uber and then walked between sites: Origins Museum which Norita as an anthropologist loved; Wits Art Museum with the amazing Andy Warhol temporary exhibition; and the powerful moving site of Constitution Hill. They left us to catch the plane to Kruger National Park and the Lowveld. But even here they got a different sense of Joburg as I suggested they take the Gautrain, rather than face the early morning highway traffic. 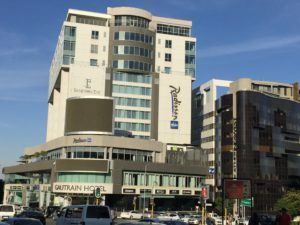 So they Ubered to the Sandton Gautrain Station which meant that they experienced both the high speed train as well as got a brief look at Joburg’s new financial hub – the Sandton CBD. I would say this was a good overview of Joburg in a relatively short time? They said that they found it a fascinating city and that they would have liked to stay longer. I love them! 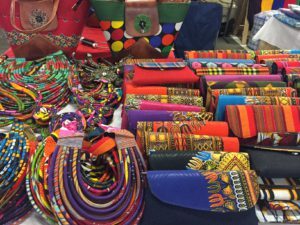 « The Rosebank Rooftop market is back and it’s better than ever!